A member of the FBI Weapons of Mass Destruction team works outside the Time Warner Center, in New York, Wednesday, Oct. 24, 2018. The print-out appears to show a parody flag that replaces Arabic characters with the silhouette of three women in high heels, and a middle inscription reading “Get ‘Er Done” — which is the catchphrase of standup comedian Larry the Cable Guy. 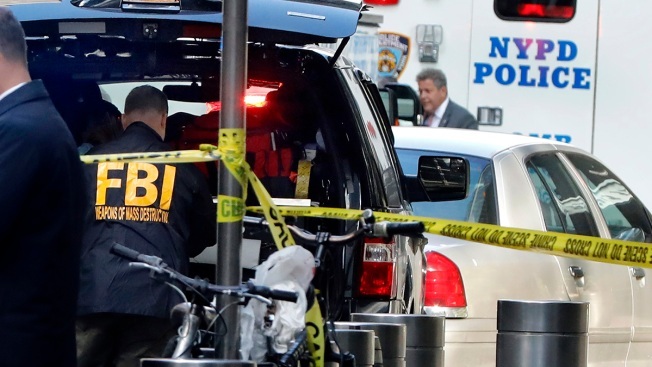 NBC News reported that an image that appeared inside the explosive package sent to CNN’s TimeWarner building in New York City and addressed to Brennan bore a striking similarity to the black-and-white flag of the terror group. A senior law enforcement official said that the image contained on the Brennan device that appears to be an ISIS flag is in fact a mocking parody of it. The official confirmed that the words “Get Er Done” were on the device.